As those of you who read this website know, I travel via home exchanges. Almost all the offers you get for exchanges, come from the developed world--meaning North America, Europe, Australia and New Zealand. So, when you get an offer from an unusual place, you jump on it. In 2010 I got an offer from Turkey, but I was booked with trip #2 Down Under to Melbourne, Australia, and Christchurch, New Zealand (before earthquakes devastated Christchurch). So, I had to turn the Turkish offer down. Grr! A year later, when I was looking for a deal for the summer of 2011. I contacted the Turkish people and they agreed. Was I excited! I was also a bit nervous, as Turkey is a Muslim country with quite a different culture. How would I deal with it--and the language was said to be "impossible". I began to read up on the history--Roman, Byzantine and Turkish--and, with the help of Pimsleur--learn a little Turkish. As with all Pimsleur courses, I play the lessons over and over in the car until I can give back the dialogues. I got through 23 of the 30 lessons before the trip. It helped. I learned the numbers, how to ask for directions (and understand what was said back)--simple things. On home exchanges I often do one side trip. After a lot of research--and help from Tom Brosnahan's Turkey Travel Planner site, decided to go to Cappadocia in Central Anatolia. I also considered going to Edirne to see Miramar Sinan's great mosque. Ultimately, I went, but I did not plan that one out in advance. I flew to Turkey early in July, met my home exchangers and left most of my belongings at their apartment on the Asian side of Istanbul in an area known as Cevezli. When I had my first experience with Turkish aggressive driving (few roads, lots of cars, and driving like a bunch of bumping cars in an amusement park), I knew I would not be driving my exchanger's car. They jokingly told me that recent European exchangers drove down their street and then turned around and parked the car--permanently. I never even drove down the street. I relied on public transportation. On the day after I arrived, I took an internal plane flight to Kayseri, where I was picked up by my hotel in Goreme, The Fairy Chimney Inn. I found the hotel as a result of The Lonely Planet guidebook for Turkey. The is run and owned by a German born man who speaks fluent English. Like many Goreme hotels, it is built in what is called a cave house. They aren't really caves. They are soft rock formations that were carved out by people as storage places for grain. Recently they have become chic places for small hotels. 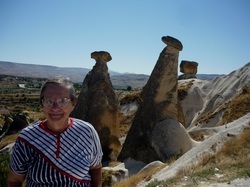 They certainly have a lot of atmosphere--which you can see in the photos of Cappadocia I have posted on another page of the website. So, how to get around Cappadocia? I contemplated either renting a car or using one available at the Fairy Chimney Inn. The traffic in Goreme is much less challenging than that in Istanbul--which is sort of one big parking lot--but the roads in Cappadocia are not all paved--and what is "paved" is often full of potholes. There are a number of different tour companies in Cappadocia. I ended up going with Yama Tours. Basically, I took a group tour with the first day I was in Goreme, was satisfied, and ended up taking them for all 3 of their day tours. That does not mean that the other tour companies doing the same thing are not just as satisfactory. I can only relate the experience I had. I also went to a caravanserai on one evening where the whirling dervishes "performed". The dervish "show" is not really a "show"; it is religious worship. I think we were asked not to take photographs--and that is why there are no photographs of the dervishes in the photographic array. A caravanserai was a sort of hotel for the caravans who brought trade goods east and west across Turkey in times past. There you could water your camels and find a place to stay. After a few days, you had to move on. Fascinating evening. Seeing the dervishes is one thing you should not miss in Turkey! The day tours covered pretty much everything I wanted to see in Goreme--"cave" churches with frescos, the underground city (where inhabitants of central Turkey would hide during invasions), a library from the Ottoman times and unusual rock formations and gorgeous scenery. Lunch was included. Please note that I took the group tour packages since I was a solo traveler. If you have a group, you might want to discuss a private tour. If the group is large enough it might be a money saver--as I pointed out in my piece about private tours in DC. There are plenty of opportunities to take photos--as you can see from the photos I have up in another file--many of which I took on my day tours. Given the short time I had, I was quite satisfied with handling my sightseeing in Goreme this way. Most of the tour companies in Goreme do similar tours (we would see the different groups at the lunch stops all eating in the same locations). Yama did include shopping opportunities. Some of these were just roadside venders--pretty much selling the same schlock all over. The one I remember best is the tile factory. I am fairly certain it was Firca Seramik. We got a demonstration and then shopping time. While I am extremely skeptical of shopping stops on tours--and I know that the guide gets a percentage--I did come home with a ceramic tile with a sort of map of the Golden Horn on it. It was my favorite souvenir of Turkey. I probably paid more than I would have if I drove up in a car, but I did not have a car. I had it framed when I got home. While most did not tip the guides, I did because I just felt more comfortable saying "thank you" that way and I know guides do not typically earn a lot of money. Guides in Turkey are licensed and go thorough a university-like course and take a difficult test covering the entire country. The one thing that I did not do in Cappadocia was take a balloon ride. It was not that I did not want to spend the money. That was part of it. Balloon rides are expensive and involve--in Cappadocia--getting up at 4:00am to do the activity. I was on a holiday and getting up in the wee hours was not attractive. Also, I had done a ballooning activity once before elsewhere and didn't really feel the need to do it just because it was listed as a "must do" in some guidebooks. After 3 days/4 nights in Cappadocia, I flew back to Istanbul and began the home exchange leg of my trip. Stay tuned.